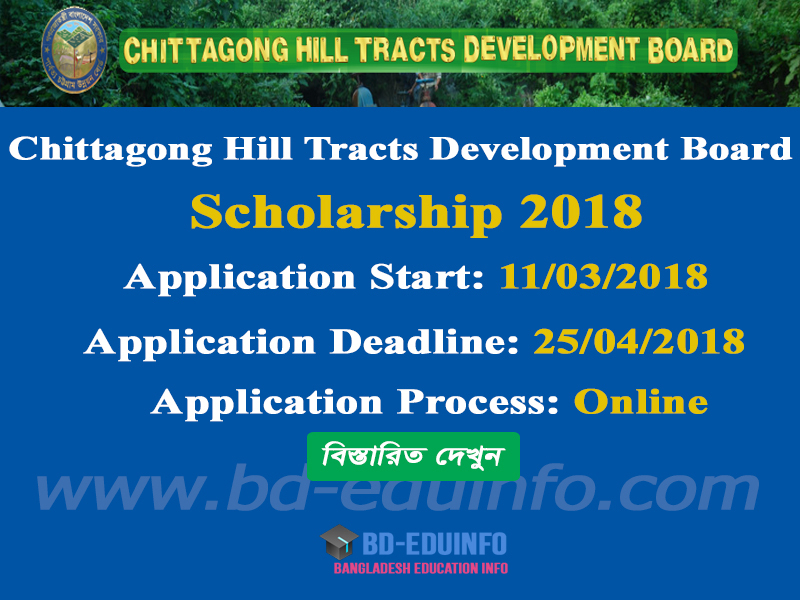 Every year Chittagong Hill Tracts Development Board scholarships to the meritorious students in need of financial aid studying at different levels of education since its beginning. 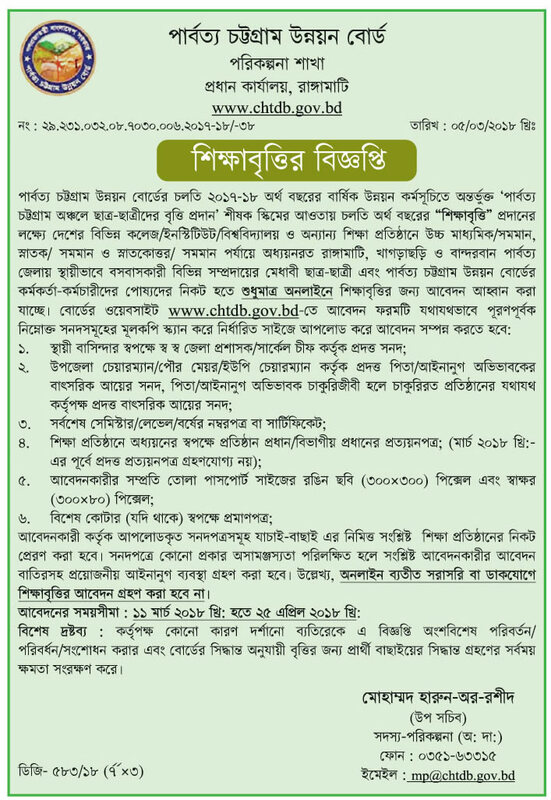 Every Interested Chittagong Hill Tracts Permanent Residence students can apply from 11 March 2018 and within 25 April, 2018.
a. Must Chittagong Hill Tracts Development Board Residence by Birth. b. HSC/Equivalent, Graduate/Equivalent and Post Graduate/Equivalent Student. 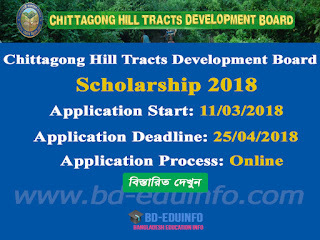 Chittagong Hill Tracts Development Board authority will be published Result their Official website notice board http://www.chtdb.gov.bd/. Tags: CHTDB, Chittagong Hill Tracts Development Board Online Application form, scholar, national scholarship, scholarships, free scholarships, scholarship search, scholarship finder, scholarships for students, undergraduate scholarships, scholarships for graduate students, list of scholarships, merit scholarships, available scholarships, scholarship application form, how to apply for scholarships, find scholarships, online scholarship application, graduate scholarships, postgraduate scholarships, private scholarships, education bd, need based scholarships, education result, scholarship information, education scholarships, scholarships for college students, scholarship offers, general scholarships, free scholarship applications, scholarship requirements, apply for free scholarships, study scholarships, schoolscholarship, higher education scholarship, scholarship positions, scholarship result, ssc education, all result bd, scholarship application letter, Chittagong Hill Tracts Development Board scholarship 2017-2018, Chittagong Hill Tracts Development Board scholarship 2017-2018 primary selected list, Chittagong Hill Tracts Development Board scholarship result 2017-2018. CHTDB, Chittagong Hill Tracts Development Board Online Application form, scholar, national scholarship, scholarships, free scholarships, scholarship search, scholarship finder, scholarships for students, undergraduate scholarships, scholarships for graduate students, list of scholarships, merit scholarships, available scholarships, scholarship application form, how to apply for scholarships, find scholarships, online scholarship application, graduate scholarships, postgraduate scholarships, private scholarships, education bd, need based scholarships, education result, scholarship information, education scholarships, scholarships for college students, scholarship offers, general scholarships, free scholarship applications, scholarship requirements, apply for free scholarships, study scholarships, schoolscholarship, higher education scholarship, scholarship positions, scholarship result, ssc education, all result bd, scholarship application letter, Chittagong Hill Tracts Development Board scholarship 2017-2018, Chittagong Hill Tracts Development Board scholarship 2017-2018 primary selected list, Chittagong Hill Tracts Development Board scholarship result 2017-2018.